- Tom Paris is promoted back to Lieutenant junior grade in this episode, after previously being demoted to Ensign in the fifth season episode "Thirty Days". - Mark Deakins appears as Axum, fresh off his role as Tournel in Star Trek: Insurrection. He was last seen on Voyager as Turanj, a Hirogen hunter in season 4's "The Killing Game". - The Delta Flyer is destroyed by the Borg in this episode. It will be replaced in "Imperfection" by the Delta Flyer II, which was of the same basic design and specifications. - In this episode, The Doctor says Seven has had her first dream. However, she had dreams in "Waking Moments" and "One". - One of the decapitated Borg heads is actually a mold of Brent Spiner's head which was used as Data's head in TNG: "Datalore", "Time's Arrow", "Time's Arrow, Part II". - Janeway's line about having a headache last time she heard the words "my mind to your mind" is likely a reference to the episode "Flashback". 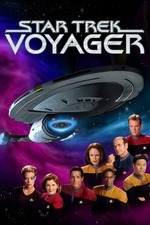 - The episode ends with Captain Janeway having been assimilated by the Borg. TNG: "The Best of Both Worlds" ended similarly with Captain Jean-Luc Picard having been assimilated. - The first shot of the final sequence, with the Borg tactical cube flying closely past the camera before being slammed with weapons, is visually similar to the first shot of the Battle of Sector 001 in Star Trek: First Contact. - The original story, pitched by future Voyager and Enterprise staffer Mike Sussman, was to have featured the return of Seven's father, Magnus Hansen. In that version, it would have been revealed that the Borgified Hansen had managed to create a "cyber underground" where like-minded drones could meet and plan an insurgency against the Collective. Hansen would have called upon his daughter to help in their fight, giving Seven hope that her father might someday be liberated from the Collective, as she had been. The producers opted to pursue a romantic story for Seven instead of a father-daughter reunion. - VOY season six was the first Star Trek season since 1987 to not feature any appearances by Michael Dorn as Worf. - When asked what stood out about season six, Robert Beltran commented that he didn't have fun during this season, calling it "dreary and tedious" for him. "We'll see you soon, Harry." "What did she mean by that?" "How many times have you actually performed this Bridging of Heads?" "And how can you be certain it'll work?" "Nothing is certain, Doctor. However, I once observed a Vulcan master perform the technique. I'm reasonably confident I can duplicate his success." "Watching and doing are two different things." "As always, your logic is impeccable." (to himself) "What a comfort..."
"It's been a long time. How are things in the collective?" "Perfect... for the most part. Voyager?" I dunno, Janeway, I think things on Voyager were better a season or two ago, but whatev. I stand by my earlier contention that this show shuts off its brain whenever the Borg Queen shows up. I won't belabor the point here, except to say that I remember on my first watch being surprisingly (or perhaps unsurprisingly) underwhelmed by the Big Reveal at the To Be Continued moment, and that Janeway's plan here is, to put it mildly, reckless. Bernd at Ex Astris Scientia analyzes this episode and part II (season 7's premiere) together, and goes into much more obsessive detail about the flubs and issues than I will. That said, I do like the idea behind Unimatrix Zero, the Borg's own "dark web." And as usual, when confronted with an acting challenge, Jeri Ryan rises to the occasion. The characterization distinction between Unimatrix-Zero-Seven and Normal-Mode-Seven is well done: subtle, but not too subtle. Fun guest star trivia: according to MA, Joanna Heimbold (Laura) was married to Titus Welliver! Having Seven's father create Unimatrix Zero would have been a more interesting story. And it would make sense. He studied the Borg closer than anyone we know. If anybody could devise a way to fight them it would have been him. The emotional play would have been better in this story - as Magnus could have watched his daughter grow up in UZ, while knowing every time she left she reverted to being Borg. This could even go some way toward explaining why the Queen had some particular interest in Seven in the prior Dark Frontier. "The first Star Trek season since 1987 to not feature any appearances by Michael Dorn as Worf." "Dreary and tedious." Coincidence? I think not. More prune juice! Pointless STO Comparison of the Week: In the continuity of Star Trek Online, there's a faction of liberated Borg called the Borg Cooperative who end up directly allied with the Federation. Members include Hugh, the former drones from Unity and the surviving members of Unimatrix Zero. * Maximum Possible Photon Torpedoes: -14. I counted a volley of three shots while Voyager was trying to distract the tactical cube. Hope I didn't miss anything. * Credulity Straining Alpha Quadrant Contacts: 14. Per the usual, encountering the Borg anywhere in the galaxy does not really strain credulity due to their transit capabilities and conquering ambitions. Agreed. The whole reason the Borg were scary back on TNG was that they were a faceless inexorable horde. No one drone mattered: lose one, the rest don't pause, don't blink, don't care. They just keep coming, immune to whatever worked before. Adding a single point of authority ruined the whole premise. To be fair to Voyager, First Contact started it and they've still featured some pretty good Borg stories (Unity is especially great), but direct confrontations between Janeway and the Borg Queen are invariably dumb and terrible. I could go on about that, but I feel like I have at length previously, and I'm still saving up a pretty long essay for Endgame. Having Seven's father create Unimatrix Zero would have been a more interesting story. And it would make sense. Right? I still would've had objections to that, but a lot fewer. Making this a weird genetic mutation so they could retcon in a forgotten Seven romance was just... well, it's awkward in the episode, and this should surprise no one. KIM: I didn't notice a little box on my chair. However, I mostly felt bad for Harry in the opening scene. Like... dudes. Little love for the guy who doesn't break the rules? * S6 had some interesting ideas, but it was clearly running outta steam. When asked what stood out about season six, Robert Beltran commented that he didn't have fun during this season, calling it "dreary and tedious" for him. I can totally see why Beltran felt that way. Chakotay was a glorified extra this season - I think Tal Celes got more to do than he did during S6. For my money, they did do some cool stuff this season: I liked the weird interest in stories about Voyager told from alternate perspectives (Live Fast & Prosper, Muse, The Haunting of Deck Twelve), and this season did feature Blink of an Eye, which is awesome. However, they also spent two episodes in Fair Haven, did a rehash of S1's Learning Curve with Good Shepherd and returned to the Borg for the finale because they didn't have any better antagonists to lean on. The Vaadwaur were the only real stab at that, and they never happened because it was a silly idea in the first place. There just isn't much going on here, and getting back to an idea we discussed last episode, that contributes to my overall disappointment in Voyager - it stacks up decently against TNG, but this episode comes after we'd seen the conclusion to the entire Dominion War. It felt like a step back for Trek, not forward. Not a lot to add to what's already been said, which I generally agree with. Susanna Thompson tries her darnedest to make the Borg Queen serenely menacing, but the Borg have been jobbed with Villain Decay to the point where, if I didn't already know what happens in the episode*, I'd have half expected Janeway to make a wager with the Borg Queen, which would have resulted in the epilogue to the second part featuring the Queen in the mess hall wearing an apron and glaring at Neelix as she scrubbed out pots and pans. Seeing the three officers assimilated mostly was interesting in terms of how they got Borgcessorized and were still recognizable as themselves; I thought that Torres' look was especially good. And, yeah, poor Harry, getting his status as the Eternal Ensign lampshaded and then having the Queen pick him out, which made me wonder (on the first viewing) if they were going to follow up on him getting injected with nanoprobes in "Collective", but no such luck. Unimatrix Zero is an interesting idea, and would have been relatively fresh at the time of original showing (about mid-2000) when a lot of people were still fairly new to online communities. Having Magnus Hansen be the focus instead of Seven's old flame would have been a definite improvement; they could have made Axum work if they'd had Seven involved with someone else and set it up as some sort of triangle, maybe, or even managed to do something with the concept of someone that you've had an online relationship with showing up IRL and it being exquisitely uncomfortable, but as it is it just doesn't have a lot of juice. I also dug the Klingon walking around with a fang sticking out. Real warriors don't have time for orthodontia. *A lot of these VOY Borg episodes got mixed up in my mind between the original watch and this rewatch; I thought that "The Raven" had all of the Hansens' backstory, and likewise thought that "Dark Frontier" had the officers' assimilation. That's not a real good sign. Happy birthday, Captain Janeway! You are the only Star Trek character born in my hometown of Bloomington, Indiana. i did some legwork on this and according to M-A it seems most likely she was raised in rural Northern Indiana, which is closer to her ancestor's shenanigans in 1999. ”Kathryn grew up on the great plains surrounding her grandfather's farm in Indiana. (VOY: "Macrocosm", "Live Fast and Prosper") When she was six years old, she once watched a bolt of lightning split an oak tree in her grandfather's yard; one she had climbed just a few hours before. Many years later, she recalled that there was no anomaly more frightening than a thunderstorm on the plains, especially at such a young age. " Ain't no great plains in Southern Indiana. What weens gots is hills. Hills en hollers.